In spite of the times, we will not cease to mention sacred guides of the past, to strengthen, revitalize and recreate. This year completes 150 years since the venerable repose of Papoulakos. He wholeheartedly fought foreign influences, western traditions foreign to Orthodox tradition. He criticized the heterodox monarch, who closed many monasteries and demolished Byzantine sacred churches. Because of his fiery sermons he was persecuted, afflicted, exiled and imprisoned. The modernizers of those times accused him of being a miscreant, because they were bothered by his words. The people followed the ingenuous fighter, the well-rounded preacher, the landless monk, the raso-wearing confessor. From early on Papoulakos understood that western theology was unorthodox and anti-orthodox. Western theology wanted to bring heaven down to earth, to keep Christians in slavery, to cultivate arrogant humanistic humanism, all of which bring atheism. He decided therefore to teach great truths to the people while risking his life. The Bavarokratia (Bavarian Occupation) was strongly against the Orthodox clergy. They wanted to Frankify everything. They were strongly resisted against by General Makrygiannis, Kosmas Flamiatos, the Kollyvades, the Philokalikoi, the Athonite Fathers, and the fearless Papoulakos. Christophoros Panagiotopoulos, or Christopanagos, or Papoulakos, or Papoulakis, was born in the small village of Arbounas in Kalavryta around 1780. He lived moderately and measured, with three brothers, and he was a trader of animals. From a young age he loved study, prayer and monasticism. Thus he departed for the Monastery of the Great Cave, where he was tonsured a monk. He returned to his village and outside of it he built a monastery, which he dedicated to the Panagia. With several attempts he managed to receive license to become a preacher. With hard work and sacrifices he began his tour, teaching against atheistic education across the Peloponnese. In 1833 the Church of Greece split from the Ecumenical Patriarchate, led by Theoklitos Pharmakidis and instigated by Georg von Maurer. Monasticism was hunted, the Protestant missionaries worked undisturbed, and Papoulakos wanted to react dynamically. He continued to preach his sermons despite having his license taken away, like a young Saint Kosmas Aitolos. Many were hostile to him, like Adamantios Korais, Theophilos Kairis, Theoklitos Pharmakidis, and others. Because of his work he was captured in 1851 in Achaia for the first time. The people listened to him with attention and loved him very much. His sermons turned to divine signs and prophecies. The people followed him faithfully and undaunted. With treachery he was arrested in 1852 and taken to the prisons of Rio. He was then confined to the Holy Monastery of the Prophet Elias in Santorini and then to the Holy Monastery of Panachrantos in Andros. And there he did not cease his soul-profiting teachings and exhortations. 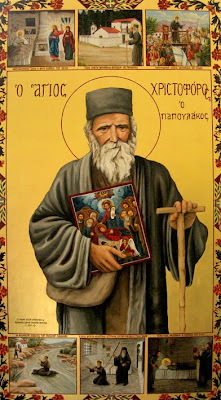 Papoulakos was a simple, honest, poor, and honorable monk. He loved Orthodoxy and Greece, Christ and the Truth. He followed the path of a confessor, a martyr, an ascetic and an evangelist of souls. Therefore, the faithful people loved him and honored him as a saint. He surrendered his spirit on January 18, 1861 - 150 years ago. His memory remains vivid for his purity, authenticity, humility and truthfulness in his life. Selfless, sacrificial and giving personalities are necessary also for today. Languid, feeble, dark and troubled days like ours want heroism, bravery, courage and daring. In our wasting, dim and difficult days we once again need a clarion call to repentance, recovery, reconstruction and correct standing. Secularism has become tired, Mimicking has worn us out, Westernization has manipulated, Syncretism has deceived, Ecumenism has missed. We need the courageous voice, heroic spirit, the confession of faith, and the fervent faith of the Venerable Papoulakos.